All photos, recipes, comments and opinions are my own unless otherwise stated. I love making creative syrups. They are an easy way to add flavor to a cocktail without increasing the alcohol content. Flavored syrups can also be used on top of ice cream or in place of pancake syrup. Having flavored syrups on hand also keeps cocktail making time a little easier and quicker. The small amount of time invested in making the syrup allows versatility with your drinks as well. 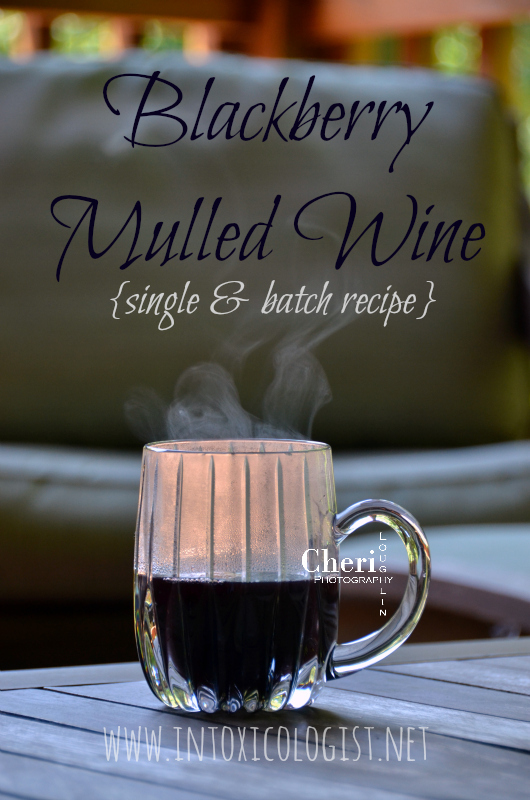 Take this Blackberry Mulled Wine for instance. One batch of syrup will make eight or more servings. That’s great if you’re serving 8 or more guests. 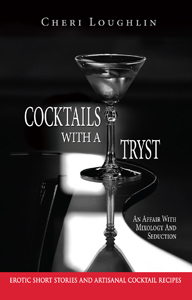 Often I’m not entertaining a crowd, but I’d still like to have a drink or two. This blackberry syrup makes it all possible. Place all ingredients into a saucepan over medium high heat. Bring to a boil and reduce heat to medium low. Mash fruits to release juice into the liquid. Simmer until liquid is reduced by about one-third. This takes approximately 20 minutes. Strain fruit and spices from liquid and discard the fruits and spices. If storing for later use: Allow syrup to cool to room temperature. 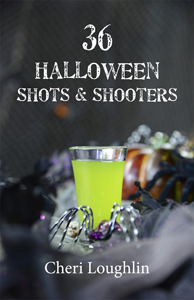 Stir in 1 ounce Vodka (used as preservative) and pour mixture into a glass container with lid. Store in the refrigerator until ready to use. I’ve had syrup with vodka added stay fresh in the refrigerator 4 months. If using for a large batch of mulled wine: Place syrup in a slow cooker or large pot. Turn heat to medium low for the stove or low for the slow cooker. Add the following according to the directions below. Add Cabernet Sauvignon and Brandy to saucepan with blackberry syrup. Heat to a low simmer. Remove from heat or keep pot on warm. Pour into a heat-proof mug. Garnish with orange twist. Place syrup, wine and brandy in a heat-proof mug. Heat in the microwave on high for 1 to 1-1/2 minutes. Garnish with Orange Twist. 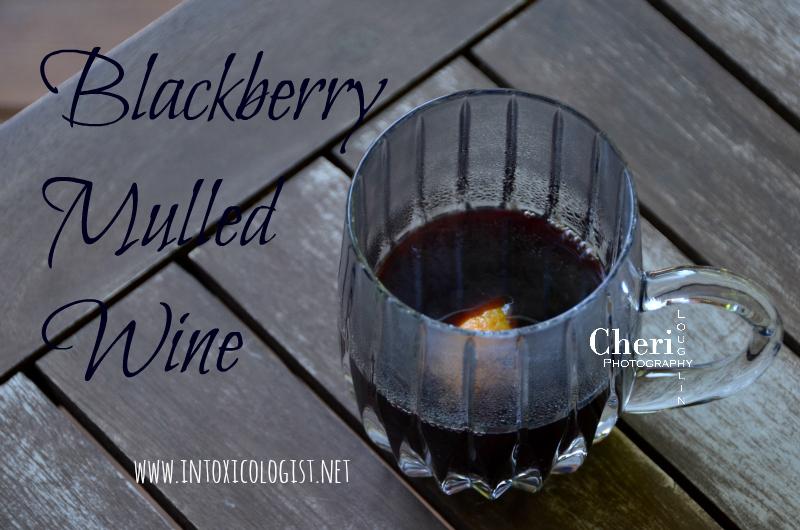 Blackberry Mulled Wine contains lush sweetness with lots of blackberry and baking spice notes. Brandy smooths out the sweetness and drying edge that blackberry can sometimes leave on the tongue. This is excellent for batch or single serve use. Recipe by Cheri Loughlin of The Intoxicologist. 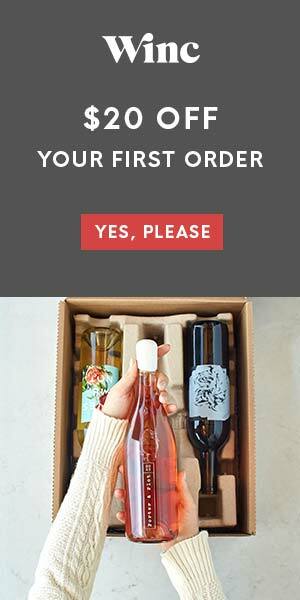 Recipe created for Barefoot Wine & Bubbly. This recipe was commissioned by Barefoot Wine & Bubbly as part of The Intoxicologist Corporate Mixology program. Find more Shellback Rum recipes here.